Please check out Newest NFC Enabled Graphical Display High Speed Meter Series DP400TP Temperatrue & Process Model and DP400S Strain Gauge Model for more advanced features with better price. 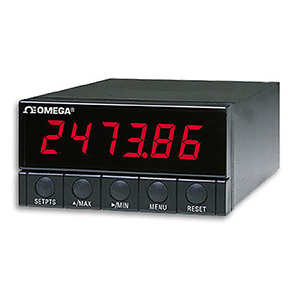 The OMEGA™ DP41 Series of digital panel meter/controllers has set the world standard for accuracy and quality in industrial instrumentation. These meters can measure a broad spectrum of DC voltage and current ranges such as 0-100 mV, 0 to 5 Vdc, 0 to 10 Vdc, 4 to 20 mA, 0 to 20 mA and more as well as inputs from 9 thermocouple types and from most RTDs, pressure transducers, load cells, strain gages, and potentiometers. Models include the DP41-U, which covers all the input types. Standard features include 6-digit display; 5 front-panel pushbutton keys; 4 open-collector outputs; and alarm/control, and analog outputs. Configurable analog output ranges are 0 to 20 mA, 4 to 20 mA, 0 to 5 Vdc, and 0 to 10 Vdc. With the RS232/485 serial communications option, the user can set the display parameters and read the current, max, and min values remotely. The DP40-R4 board option provides four relays, activated by the selected setpoint. *DP40-S24 option comes with 6.5' communications cable with phone plug termination. For proper termination to a computer, 9-pin and 25-pin connectors are offered on this page.